I've partnered with Carter's and The Motherhood to share this post and giveaway with you. Opinions are my own. We haven't always been "on trend" at our house, mostly because our boys like to play rough and be outside all the time. We seem to be stuck choosing between durable and fashionable, and I hate that we tend to go with durable each and every time. 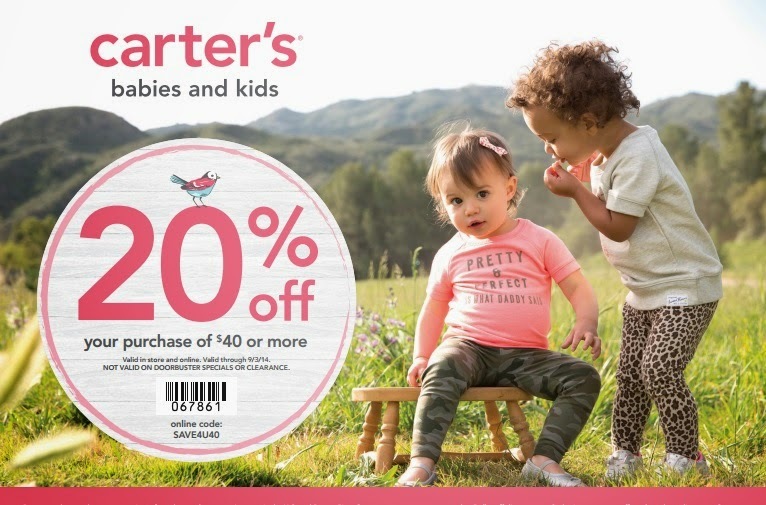 This fall, however, Carter's has pleased me greatly with their new fall line of clothes for babies, toddlers, boys, and big boys; their clothes reflect the newest trends across all sizes -- and they are super sturdy, too! 1. Camo. I can't say enough about this. We love camo year-round, and often buy sporting and hunting clothes to give my boys the look. Carter's has incorporated camo patterns in so many of their items this year. The camo woven button-down shirt we purchased is just one example that can be worn dressed up or as a casual layer over a tee! 2. Layers. Did I mention that we like to mix and match? With several tees and button-ups in a wardrobe, boys can design their own looks from preapproved pieces, and I don't have to worry about how they look when they leave the house! 4. Fleece. Soft is back! Babies will enjoy snuggling one-piece fleece pieces like this microfleece jumpsuit. My little guy looked put-together, even though it's as easy to put on as a pair of pajamas! It's hot now, but this winter, we'll love having a wardrobe full of fleece items in solid colors or prints. 5. Plaid. Are you mad for plaid? We are, especially the shirts that features some "softer" colors for boys. (Did you know that way, way back, pink was the color designated for baby boys.. not blue?) Kids can feel confident sporting this all-purpose woven plaid shirt with color choices that include pinks, blues, greens, and more! While my boys claim to not care what they wear whey they go out, the truth is that they beam with pride when they get to try on new clothes. Moses had a blast exploring our farm in his combo of the woven camo top, $5 t-shirt, and ripstop pants. Can you tell that this usually shy and quiet boy feels powerful in his new threads? Wanna Win? We are giving one lucky reader a $50 Carter's gift card to spend on their own back-to-school shopping adventure! This card is enough to buy the looks featured on Moses (above) or any look you please! To be entered to win, just comment on this post with your favorite trend for boys this fall. You have until August 5th at 11:59pm CST to get your entries in. One entry per person, please! U.S. 18+ only.